King Locksmiths is a dependable Locksmith Company in Maryland providing full residential, commercial, automotive and emergency locksmith services. However, this is not our only specialty! We, at King Locksmiths, also excel in door installation, replacement and repair services – all that is needed for a very safe door. We have been in this business for many, many years which gives us the necessary proficiency and experience in this business of door replacement. King Locksmiths happens to be one of the top business’ for locksmith services and door replacement, repair and installation serving Upper Marlboro Maryland, and the surrounding areas. Why Choose Our Service for your PG County Door Replacement? Your cost is reduced because we have our own in-house Upper Marlboro door replacement, repair and installation experienced workers. We do not hire a contractor to accomplish our personal and residential door repair, installation or replacement services, and this always saves money. This business is one of only two companies which offers in-house Upper Marlboro door replacement, installation and repair. Our workers are highly experienced and trained and have available to them all the necessary tools needed for providing these important services. Other companies may provide door installation services for Upper Marlboro Maryland, but before you decide, be sure you know that they are not paying extra for a third party contractor to provide the services you need. The doors are certainly one of the most important features of any home or establishment, whether the property is personal or commercial. Business owners and homeowners should see to it that their doors are in acceptable working condition. If you are having any concerns regarding your doors, one of the wisest steps to take is to make a call to door an installation, repair and replacement company. But what company can you decide to contact? Well, choosing the more reliable one has a lot to do with receiving the best services that you desire. 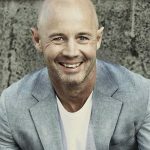 Are the door entrances into your residence causing you to feel insecure because they are old, worn out and do not work well? If home are not in good working order anymore, it is time now for door replacement. Door Replacement is not only for ease and convenience; it is also a matter of security for your home. It is always good to assure that all the doors in your residence are up to the task of keeping unwanted visitors from entering into your private property. Doors are very needed tools in your personal property because they provide privacy and security for your family. Also, aside from the protection that they will give, secure and new doors will always add style in your personal property. However, sometimes replacing your doors probably will be a very stressful and difficult project to start doing. We make an effort to minimize the stress of thinking about and successfully accomplishing door replacement. We can and will help you make the best choice of doors as well as make sure that they are installed securely, properly and expertly. 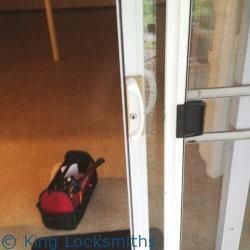 Follow this link for our Residential Locksmith Gallery of recent projects including home door repair and replacement. All of the procedures which are included in our specialized service will be executed by our trained door installation specialists who are experts in the specific knowledge, training and skills for use in the process of installing new doors in an establishment. The first step in the completion of this service is the process of inspecting the areas where commercial doors will be replaced and installed. Our door installation experts will then start the process of removing the old doors and installing the new doors. Our clients may always expect that our door installation business will never fail to live up to the quality that we have promised to them. The door installation experts at King Locksmiths have more than five years of experience in the expertise of door installation, door repair and door replacement. 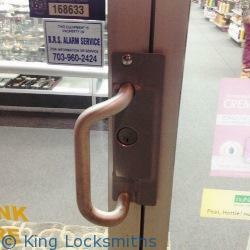 We are your expert Upper Marlboro commercial locksmith team, providing full business security and locksmith services. We are also able to install door hardware to fit your choices, such as Access Control Systems, High Security Locks or Keyless Entry Locks. We have been performing door installation, replacement and repair for Upper Marlboro Maryland and the surrounding area for many, many years. See our gallery of our latest door replacement, repair and installation jobs here. Give us a call today in order to give us the chance to Install Doors for your home or commercial building. We provide the option for you to request all of our door services as well as any Upper Marlboro Maryland locksmith service via our online request form here. Door Replacement Upper Marlboro Maryland: Install or Repair Doors https://kinglocksmiths.com/door-replacement-upper-marlboro/ 4.0/5 based upon 6 reviews.